Guests over the age of 24 months must have a ticket to enter. Note: This may vary per event; check the event ticket policy for verification. Alcoholic beverages can be purchased by persons aged 21 or older once inside the arena with proper legal identification. Alcohol sales can be terminated at any time at the discretion of AT&T Center management. Outside alcohol may not be brought onto the AT&T Center grounds. Certified service animals for guests with disabilities are welcome at the AT&T Center and must remain on leash or in a harness. All other animals are prohibited unless approved by management. NBA regulations prohibit noisemakers from being brought into the AT&T Center for any Spurs games. For Rampage games, all noisemakers except for cowbells are prohibited. Patrons will be allowed one cowbell per person to be utilized moderately. Cowbell size will be restricted to 8” in length and AT&T Center Security will utilize this size restriction when determining if cowbells will be allowed into the arena. Excessive use, determined by arena management, or complaints from surrounding patrons will result in removal of the cowbell. Confiscated cowbells will be checked in for pick up after the event at Guest Services behind section 101. There are six ATM locations within the AT&T Center. They are located on the Plaza Level by sections 103, 110, 117, and 125. Balcony Level ATMs are located by sections 208 and 224. For the safety and comfort of our patrons, during franchise events, we request that shirts and proper attire be worn inside the AT&T Center. Jump-start assistance is available by asking any parking attendant or security personnel. Tickets are NOT availale at the box office the day they go on sale. For Spurs and Rampage games, please leave cameras with detachable lenses or lenses longer than three inches at home, along with all video cameras. They are prohibited at AT&T Center events. Any item that is too cumbersome to keep under a seat (ex. : stroller, wheelchair, large umbrella), should be checked-in at our Guest Services location near Section 101. Our designated driver kiosk is located outside of Section 118 during Spurs and Rampage games. Designated drivers receive a wristband good for one free soft drink and must be 21 years of age with a valid driver’s license. Please click HERE for directions to the AT&T Center. Vehicles dropping of passengers may enter using any gate. It is recommended that you arrive early for post-event pick-up. At the conclusion of the event, please access our designated pick-up area using Gate A along Houston St (just West of Freeman Coliseum). Elevators are located at each of the corners of the AT&T Center. Escalators are available on both the North and South Concourses of the AT&T Center. Our HEB Fan Zone offers an interactive play area for children, as well as adults, during franchise sporting events. Pop-a-shot baskets and specialty concessions are available in this fun-filled area located on the Balcony Level between Sections 215 & 217. First Aid is located on the Plaza Level across from Section 119, and in the Balcony across from Section 222. In the event of an emergency, please notify any AT&T Center representative or uniformed sheriff’s officer. A variety of food and beverage options are available throughout the AT&T Center. Items for children such as baby bottles, formula, etc., are allowed. If you are bringing a group or would like more information about group discounts, please call 210-444-5959. For a special private event, please contact 210-444-5147. All AT&T Center guests should be treated in a consistent professional, and courteous manner by all arena and team personnel. Disruptive behavior, including foul or abusive language and obscene gestures is prohibited. Alcoholic beverages should be consumed in a responsible manner. Guests are required to sit in their ticketed seats and show their tickets upon request. Engaging in fighting, throwing objects, or attempting to enter off limit areas will be cause for immediate ejection from the arena. Smoking, including e-cigarettes, is prohibited at the AT&T Center. Selling tickets on the AT&T Center property, without permission, is prohibited. Guests are required to comply with arena management regarding facility operations and emergency response procedures. Guests are prohibited from carrying other guests on their backs or shoulders at the AT&T Center. Management reserves the right, in its sole discretion and without refund of any portion of the ticket price, to refuse admission to or eject any person(s) whose conduct is deemed inappropriate or detrimental to the enjoyment of others. Please report any issue to the nearest usher or text CARE to 69050 for assistance. Our Service Innovation Team is ready to help with any questions you may have regarding the services and amenities within the AT&T Center. Guest Services locations are located on the Plaza Level near Section 101, and in the Balcony Level near Section 206. You can reach a Service Innovation Team member by phone Monday-Friday, 8:30am-5:30pm, at 210-444-5140. For a complete listing of hotels located around the AT&T Center and downtown San Antonio, please click HERE. If you lost an item during an event, please contact the nearest AT&T Center staff member for assistance. You may also turn in any found items at our Guest Services locations, near Sections 101 or 206. Items will be held for 30 days with unclaimed items donated to charity. On non-event days, please call the AT&T Center at 210-444-5012 for lost item information. Lost children should contact the nearest AT&T Center staff member. All lost children will be taken to Guest Services by Section 101. Merchandise is available throughout the concourse during AT&T Center events. Our Fan Shop is also open Monday-Saturday 10am-5pm, and Sundays 11am-5pm and during Spurs and Rampage games. The shop is located on the Plaza Level on the south side of the AT&T Center and features a variety of merchandise for the Spurs, Rampage, and San Antonio Livestock Exposition (only during the Rodeo in February). You can reach the Fan Shop by calling 210-444-5555. To book our meeting rooms or business centers for your special event, please call 210-444-5147. The AT&T Center will introduce the use of magnetometers (walk-through metal detectors) as part of enhanced security procedures at all entrances of the arena to create a safer environment for all guests in attendance and to allow entry to be as quick and efficient as possible. Guests will be asked to remove any metallic items during the magnetometer screening process, including cameras, keys and cell phones at all points of entry. All bags and purses will also be screened. Fans without bags are encouraged to use the "No Bag Lanes" to expedite the process. For most events, doors open 1 hour prior to the start time. This does vary by event. Please call our Service Innovation team at 210-444-5140 or by email for event specific information. The selling or sampling of merchandise, food, beverages, or other items on the property, without written AT&T Center authorization, is strictly prohibited. For some events, a Parent Area will be located in the Bud Light Courtyard inside the west entrance. The Parent Area is provided for guests who did not purchase a ticket to attend the event but has a child that is in attendence. Parents will pay for parking, and are able to wait for their children in this area until the show ends. The AT&T Center features more than 7,000 parking spaces on its property, including parking for patrons with disabilities located in Lots 1- 4. Prices and availability for parking varies by event. Please call the AT&T Center at 210-444-5140 for event specific prices and information. Poles or sticks to display signs or flags are prohibited. Signs may not be displayed during play at a sporting event, be placed on the court, or affixed to the building structure. Please call our Service Innovation Team at 210-444-5140 regarding event specific sign policies. You can hold your next corporate or private party at the AT&T Center. The facility can accommodate events from as intimate as 10 to more than 20,000 patrons. The AT&T Center features a variety of available locations that can be rented on non-event days for conferences, meetings, trade shows and private parties. Catering and event planning services are also available. Events can be held almost anywhere, from the Event floor to the spacious Party suites. Please call 210-444-5147 for more information. Prohibited items may vary based on the type of event being held at the AT&T Center and at the discretion of AT&T Center staff. Large bags, coolers, bottles, cans, food, and other containers are prohibited. Galaxy Note 7 smartphones may not be charged at the AT&T Center, Toyota Field or any other SS&E locations. Please visit http://www.samsung.com/us/note7recall/?cid=ppc- to process your exchange. Re-entry is not allowed at the AT&T Center. The SWBC Terrace Restaurant, located on the Terrace Level’s west end, features a variety of cuisine for our guests with premium seats. Call 210-444-5389 for more information on our Terrace Restaurant and to book your reservation today. For your convenience, there are restrooms located on all levels throughout the AT&T Center. All restrooms meet or exceed ADA specifications. The AT&T Center also provides private bathrooms, on every level of the building, that accommodate patrons with disabilities who are assisted by a companion or family member. 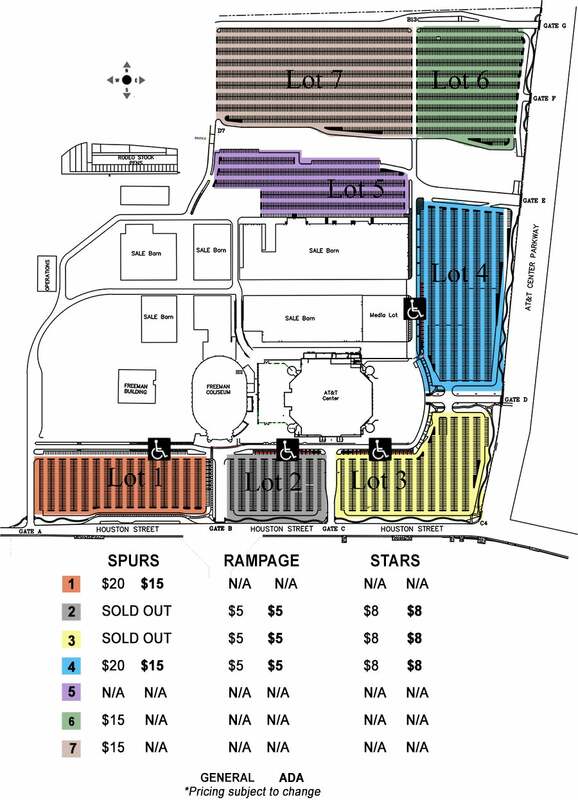 Spurs and Rampage season tickets are available by calling 210-444-5050. Our Season Ticket Service hotline is available by calling 210-444-5697. Season Ticket Members are also encouraged to visit Season Ticket Headquarters, outside of Section 113, during Spurs and Rampage games. If you are interested in sponsorship opportunities with the AT&T Center call 210-444-5093. If you are interested in sponsorship opportunities with the San Antonio Spurs, the San Antonio Rampage, or other events, please call 210-444-5524. Strollers can be checked in at Guest Services (Section 101) on the Plaza Level. Any parties interested in purchasing a Courtside or Terrace Suite, Terrace Ledge Box, or other Premium Packages at the AT&T Center should contact us at 210-444-5644. Tailgating is not allowed at the AT&T Center. Overnight parking is also prohibited. Taxis are available after most events and can be obtained outside our West Entrance, closest to the Freeman Coliseum. Guests, needing assistance or information during an event, can now text the keyword CARE to short code 69050 with their request and location. Text information and assistance is now available without having to leave your seat! If you are interested in purchasing tickets to an AT&T Center event, you can do so in person at the Southeast AT&T Center Box Office located directly across from Parking Lot 3. You can also purchase tickets by phone at 210-225-8326, or online at www.ticketmaster.com. Spurs Sports & Entertainment has designated the AT&T Center as tobacco and smoke-free building. The new policy includes all forms of smoking and tobacco use, including but not limited to, cigarettes, cigars, electronic cigarettes, personal vaporizers, smokeless tobacco and tobacco pipes. There will be no designated smoking areas anywhere inside the AT&T Center. The tobacco and smoke-free environment extends 500 feet from the AT&T Center. AT&T Center building tours are currently unavailable due to ongoing renovations. For additional information, please contact the Service Innovation Department at 210-444-5140. We allow patrons to keep umbrellas under their seat, if they will not interfere with the foot space of other patrons. Umbrellas can also be checked into Guest Services near, Section 101, until the end of your event. Video recording is not permitted during AT&T Center events. Video cameras are allowed to be used to record a family member or friend in an on-court promotion or performance that are otherwise impermissible. These cameras must be tagged by Guest Services upon entry. If you need assistance getting to or from your seat, courtesy wheelchairs are available upon request. Please contact your nearest usher or Guest Services Representative for complimentary assistance. The AT&T Center uses magnetometers (walk-through metal detectors) as part of enhanced security procedures at all entrances of the arena. In compliance with the NBA’s league-wide security policy, the magnetometer screening will take place at all events to create a safer environment for all guests in attendance and to allow entry to be as quick and efficient as possible. Guests will be asked to remove any metallic items during the magnetometer screening process, including cameras, keys and cell phones at all points of entry. All bags will be searched upon entry. Backpacks, bags and purses larger than 12x12x6 are prohibited. Get to and from the AT&T Center with ease! Sign up for Uber and insert the promo code ATTCENTER2 to receive a free ride, up to $15 off. This promotion is for first time riders only! Click here to create an account. Already an Uber rider? Don't forget to share this promo code with others so that they can enjoy a ride to and from events in San Antonio. After the event, request a ride home through the Uber app and meet your driver in front of the Freeman Coliseum. For your safety, and the safety of others, please do not meet Uber drivers anywhere other than the Uber pick-up lane in front of the Freeman Coliseum.